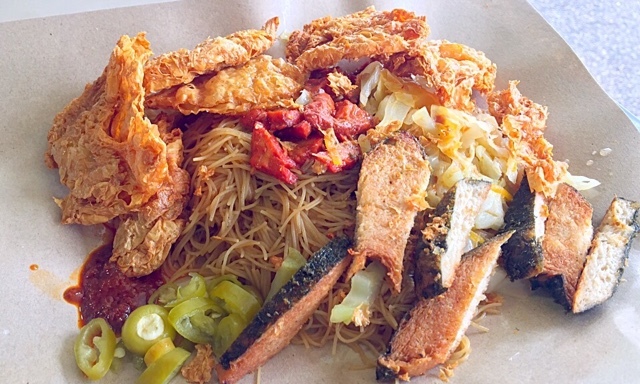 Seng Hee Vegetarian Bee Hoon in Ang Mo Kio - Delicious! On a Good Friday morning, Seng Hee has already formed a queue. I counted silently and there were 15 persons in the queue! Usually, I do not like to queue for food but today, the queue did not deter me from enjoying the sensation of eating Zai Mi Fen with my yummy "fish" and "goose". It was around 20 minutes later before I got to order. It was a moving queue so it was not so bad. The worst queue was the Tai Hwe Noodles because I was rooted to the ground for many minutes. When I attempted to take pictures of the ingredients at the stall, the ever smiley auntie told me that the best time to take pictures was at 6.30am because the ingredients would be filling the containers to the brim. Around 9.30am, the ingredients were already running out. 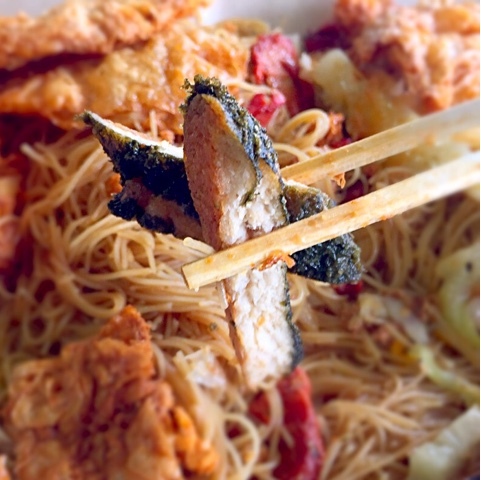 A basic vegetarian noodle package, with a bit of mock char siew, cabbages and mock goose, cost only S$2. I ordered the basic package and topped it up with an additional piece of crispy mock goose and 2 pieces of mock fish. I was charged S$4.60 for it, which I thought, was reasonable. The vegetarian bee hoon tasted as delicious as I remembered. A nice vegetarian bee hoon has to taste light - not oily yet tasty. The pieces of mock goose were extremely crispy yet there was no trace of oil leaking. I requested for curry sauce. The sensation of bee hoon soaked in curry sauce, with pieces of crispy goose,and sour green chilli, was divine... Lovely. I am extremely in love with mock fish. 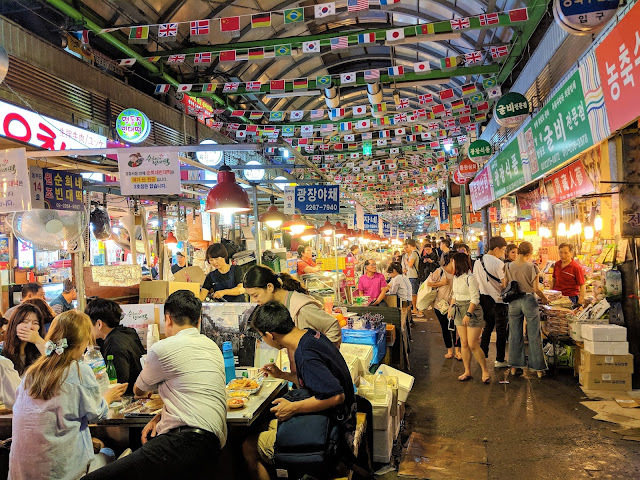 Mock fish balls and mock fried fish are my all time favourites. 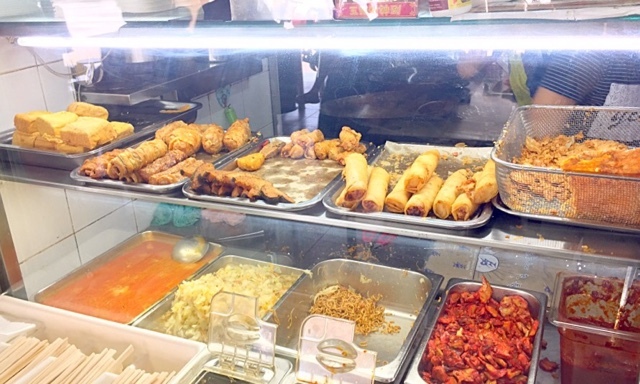 One of the reasons why I love Seng Hee so much after a colleague has recommended this stall to me, is that Seng Hee sells delicious fried mock fish. The seaweed skin was delicious and slightly crispy; the fish meat was soft and yummy. 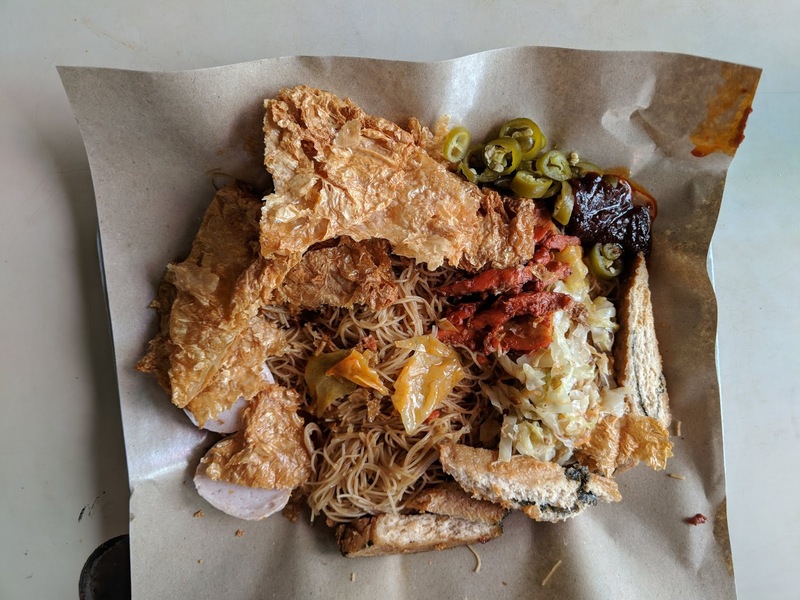 I have been to other recommended vegetarian bee hoon stalls but not all of the stalls sell mock fried fish and those that sell, make terrible dry versions. 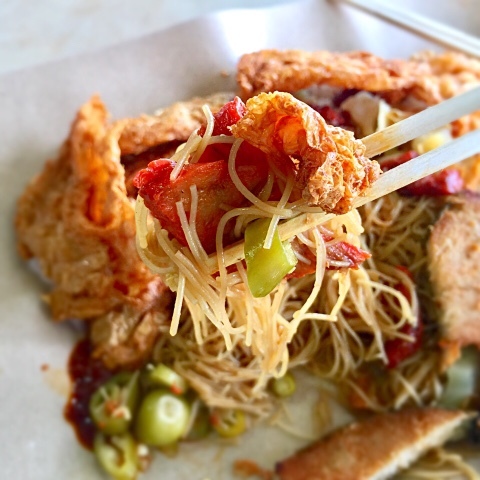 I am still on the prowl for Vegetarian Fish Balls Sliced Fish Bee Hoon. Please leave your comments if you know which stall in Singapore sells that. 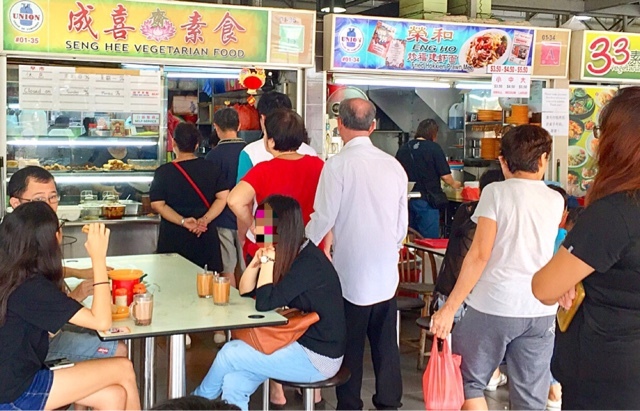 Please feel free to leave your comments and share your experiences at other Vegetarian Bee Hoon stalls!